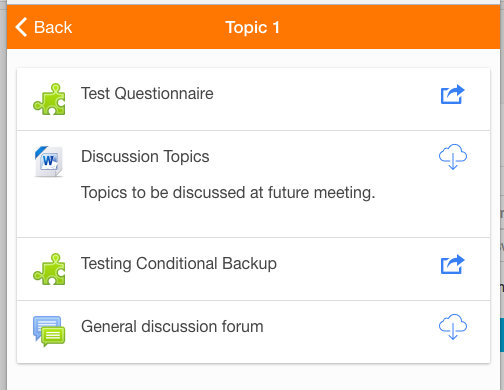 With version 3 of Moodle came the Moodle Mobile app. Out of the box, most of the core Moodle plugins came supported. But, third-party plugins do not function by default in the mobile app. In Moodle 3.1, the mobile app added support for "Remote add-ons". This support allows plugin providers to add support so that their plugin can function within the mobile app. Now, I should point out that Moodle is currently working on a much simpler system for adding mobile support to your plugin, but it will be a while before it is ready. When it is ready, the work I am about to undertake will likely be moot. This post will be the first in a series where I will attempt to add mobile support for my questionnaire module. I say "attempt", because this will be using some technologies that I am not familiar with so I will be learning as I go. I won't guarantee success, but I will document the efforts. 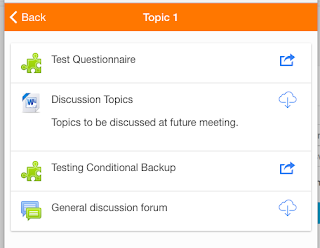 To start with, the main developer documents for Moodle Mobile are here. Looking through that list, I'm going to start with setting up a development environment on my Mac. The documentation suggest using Macports to install Nodejs. It also says I need to use version "v0.12.7". But, it looks like Macports only has versions from 4. * to 7.*. So, Macports is out. The documentation also provides a direct download link for "v0.12.7", and it has a Mac "pkg". So I download that and run the Mac installer. As a result, I have "node" installed at /usr/local/bin/node and "npm" installed at /usr/local/bin/npm. The next step asks me to run the command npm cache clean. When I do this, I get a series of errors. which seem to indicate permission problems. Likely I need to elevate the permission level this command runs at, so I add a sudo to the front of the command and try again. The new command, sudo npm cache clean works fine. I'm going to assume I will need sudo for the rest of the commands in the document as well. But they seem to be warnings about outdated "node". I know we are using an older version of "node", so I believe this will not be an issue. Now I need to install the "bower" and "gulp" node packages. Again, there are some warnings about outdated releases. But I'm just going to leave them as is for now. At the end of that, I have 27 new gems installed in /Library/Ruby/Gems/2.0.0/gems/cocoapods-1.2.0/. There are a number of warnings and errors that are output as this executes. Most of them appear to be problems with outdated modules. I am going to disregard those for now. All three seem to install okay. The only warnings I receive are for outdated dependencies. So, guess I won't be using sudo here. I rerun the command without sudo, and get a long list of files being installed. All of them went into the local repo below www/lib/. Which again added files below my local repo. That seems to just move my Chrome window to the front. Probably because I already had it open? I'll assume it's all good. Since I chose the 'localhost' option I enter 'http://localhost:8100' in my chrome browser window. 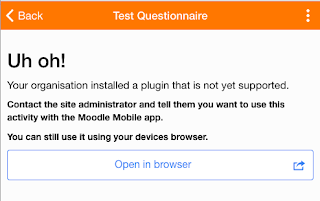 The browser displays the Moodle Mobile app! I configure it to my local running copy of Moodle, and I'm in business! And, I see that I really do need to add mobile support to the plugin! Next posts will be me trying to make this happen.